If the big business media outlets are right, every entrepreneur out there is working 17 hour days starting when they’re 16 years old. We live in a culture of hustle in the US. We’re surrounded by stories of super successful people who push themselves to the limit, and who put their work ahead of everything else in their lives- and we exault them for it. But for those out there who would rather work to live than live to work, fear not. 17 hour work days are not the only path to success. You can build time off into your business and not torpedo your profit margin or growth. 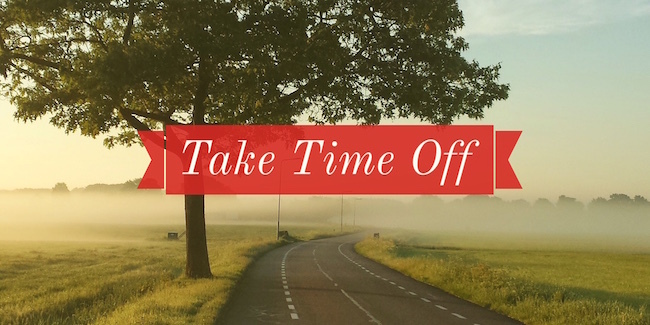 Taking time off does require that you have the ability to think at least 3 months in the future for your business. You have to put systems in place to either earn money before you take time off, or to earn passively while you take time off. Start with your annual income goal. What do you want to make throughout the next 12 months? Then, subtract the time that you don’t want to work- what does that mean for the remaining parts of the year? Do you need to have higher income months beforehand, or do you want to create passive income streams that will work for you even if you’re not there in person? If you are a service provider, it’s critical to set boundaries with your clients and customers. Let people know that you will be unreachable for work at least a month in advance so no one feels caught off guard. Set clear outlines for your availability when you sign a contract with people, so they know what days of the week and times of the year, and even hours of the say, that you are available. If you have the capital, consider outsourcing some client work while you take time off. You can outsource big or small things. You can hire someone to answer client emails while you’re away, or to host events for you. It’s your call! Finally, go ahead and make your plans for your time off. Book the trip or reserve the campsite. By making a commitment to your time off, you’ll have motivation to make it actually happen. You don’t want to cancel those plans you just made, right? You don’t want to potentially lose the money you put down for your trip or your time off, right? Once you have the plans on paper, you can work backwards. Now you know how much time you have until your break, so you can reverse engineer your financial and work needs.